Cathie Filian: Watch the video from QVC! Watch the video from QVC! Visit this link to order the stamps and view a video from the presentation. Once you are at the page click the on air presentation to view the video. 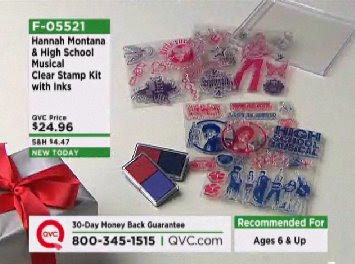 Encourage your little rocker to decorate her notebooks, book covers, and create colorful posters with these totally cool Hannah Montana and High School Musical stamps! The easy-to-use mount make them perfect to hold. Plus, because they're a cinch to clean, they can be used over and over again! From Disney and Plaid. That is a very cute stamp set, I ordered two for my girls.